In the panel above, the Front Landscape Device at Location Outside has been selected, as indicated in the drop-down lists at the top-left of the panel. You select any Device (that has been selected for inclusion in tenHsDesktop monitoring) with these drop-down lists. You can also change the Device selection to any Device displayed in the Devices panel by clicking on the Device in the Devices panel -- the Device Display panel will change to that Device. Don't like the way a Device is displayed in the Device panel? Click on it to open the Device Action panel, click on the Edit button, and the Options panel will open to the Device Display tab for that Device. The left side of the Device Display panel contains controls that are used to define when and how the Device is to be displayed in the Devices panel. The right side of the Device Display panel displays the current status of the selected Device. You specify what is to be displayed by entering the text you want displayed for each of three different Formats (more on that later). You can imbed within the display text one or more replacement strings identified by a leading percent sign (%). The value of these replacement strings will be inserted into the display text when the Device is displayed in the Devices Panel. The right side of the Device Display panel shows each of the replacement strings for the current Device (the values are shown in realtime, and will change if the status of the selected Device changes). In the panel above, the display text for Format 1 is: Landscape: %0%t You can see in the Devices panel that %0 has been replaced with the icon shown at the top right of the panel, and %t has been replaced with Dim 50&#37; which is displayed as Dim 50%. We'll come back to formatting the display line. The next sections describe how to configure the display parameters for each Device. 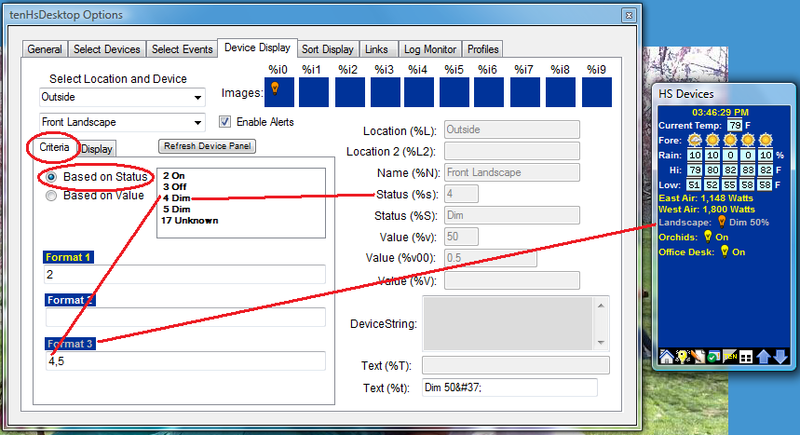 tenHsDesktop initally sets the display parameters for each Device to a set of default values. The defaults cause a Device to be displayed if it is ON or DIM and displays the Devices' Name (%N), icon (%i0), and text (%t). You can globally change any of these values for ALL Devices to better fit your installation and viewing preferences. 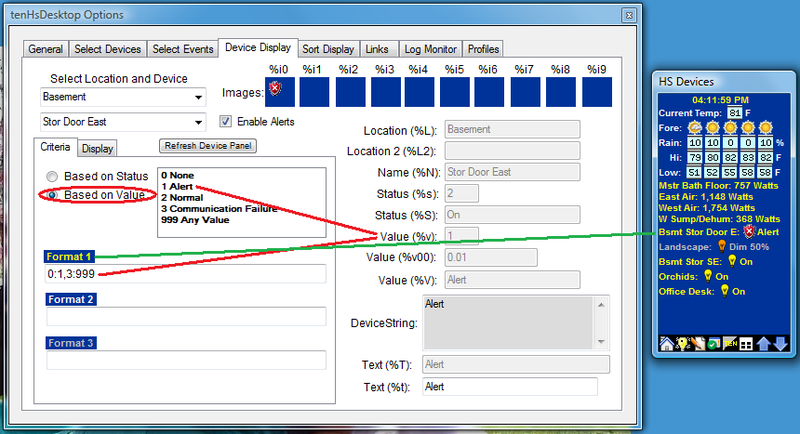 First read the next two sections to better understand how an individual Device is configured. Before you begin configuring individual Devices, however, you should globally set ALL Devices' display parameters to ones that fit the majority of your Devices. Open the Options/Utilities panel to accomplish this. The Criteria tab is used to specify when to use each of three different Formats. Format 1 will display the Device's text in Yellow, Format 2 will display the text in White, and Format 3 will display the text in Gray. You specify the criteria for each of the three formats as one or more numbers or range of numbers separated by a comma. A range is specifed using a colon (for instance, 5:15). The criteria can be based upon either the Status of the Device or the Value of the Device. In the panel above, the criteria is based upon the Status of the Device. 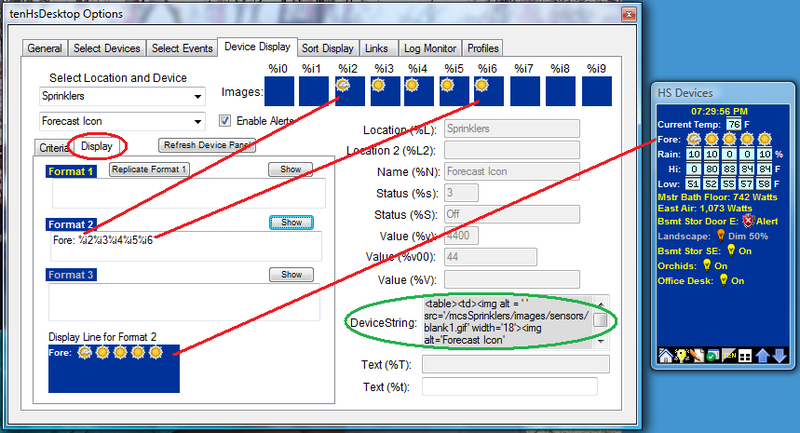 tenHsDesktop first checks the Device's Status or Value against the criteria for Format 1, then Format 2, then Format 3. As soon as a match is found, that Format is used. If no match is found, the Device is not displayed. In the above example, Device Front Landscape has a Status of 4 (Dim). The specified criteria is based upon the Device's Status, which is 4, and therefore Format 3 is used and the Device's display text is shown with the color Gray. The actual text used to display the Device is specified using the Display tab (more on that in a little bit). A list of typical Status values is shown for the Device. As you change the Format values, you can click on the Refresh Device Panel button to update the Devices panel and see the effect of your changed criteria. In the example above, the Device Stor Door East is open (a DS10a). The criteria for this Device is based upon its Value, which is 1 (Alert). The only format criteria specified is for Format 1. It specifies to use Format 1 if the Device's Value is between 0 and 1 or between 3 and 999. Basically, don't display the Device if its Value is 2 (Normal) -- for all other Values display it using Format 1. The door is open (Value=1) so it is displayed using Format 1. A list of typical Values is shown for the Device. As you change the Format values, you can click on the Refresh Device Panel button to update the Devices panel and see the effect of your changed criteria. In many cases, you will want the same display text for all three Formats (just displayed in different colors based upon the display criteria). You can enter the display text for Format 1 and then click on the Replicate Format 1 button to copy the display text to Format 2 and Format 3. To see what the display text will look like you can click on the Show button for any Format and the display text, with substitutions, will be displayed at the bottom of the panel. Click the Refresh Device Panel button to refresh the Devices panel to reflect the new display text that you just entered. In many cases you will want to enter more meaningful display text than just the Device Name (%N) that is displayed as default. You may also want to enter more succint text than the Location and Device Name in order to fit on a single line in the Devices panel. The display line at the bottom of the panel (click on one of the Show buttons) is the same width as the current width of the Device panel to help build a display text that will fit on a single line of the Devices panel. Its width will change dynamically as you resize the Devices panel. You can specify that Alerts should be generated for this Device when its Status, Value, or DeviceString changes by checking Enable Alerts.